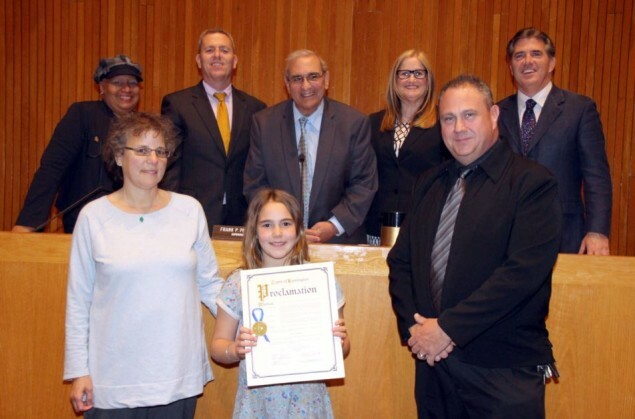 Huntington Supervisor Frank P. Petrone and his Town Board colleagues gave special recognition at the May 10, 2016 Town Board meeting to a nine-year-old girl for her efforts raising money and obtaining donations of food and supplies for the Town Animal Shelter. Julia Schwing began her efforts about a year ago with a lemonade stand that raised $17, which she donated to the Give A Dog A Dream Foundation, the not-for-profit organization the Town formed to raise money earmarked for providing specialized services for the shelter’s dogs. Julia then started a towel and blanket drive at her school, as well as one to get donations of food. Every week for the past year, Julia has brought the donations to the shelter. For her ninth birthday in March, Julia asked her friends and classmates to bring toys, food, blankets or donations instead of birthday gifts. She collected a total of $400 for Give A Dog A Dream at her party. Supervisor Petrone presented Julia with a proclamation thanking her for her efforts and called her an inspiration for everyone. In the photo: Front, l-r, Amy Schwing, Julia’s mother; Julia Schwing; and Animal Shelter director Gerald Mosca. Rear, l-r, Councilwoman Tracey Edwards, Councilman Mark Cuthbertson, Supervisor Frank P. Petrone, Councilwoman Susan A. Berland and Councilman Eugene Cook.